We met Coral back in January during the Wedding of a Lifetime bridal show at the Mobile Convention Center. She fell in love with our Magic Mirror photo booth. We custom designed a rustic wood print with “coral” flowers. She also was the first to use our barn door background. We arrived at 5 Rivers Delta Center to the wonderful aroma of Sonny’s BBQ. They had smoked a whole pig to feed the wedding guests. I wish I thought to grab a picture of it. It was definitely a beautiful sight. After the dockside ceremony, it was time for us to shine. Guests filed in and started up a fun filled night of food, cake, dancing and of course photo booth pictures. Russell Combs did a great job keeping the tunes flowing. Any DJ that still throws in a little Freak-A-Zoid is aces in my book. The night have eventually came to an end but the Magic Memories will last forever. 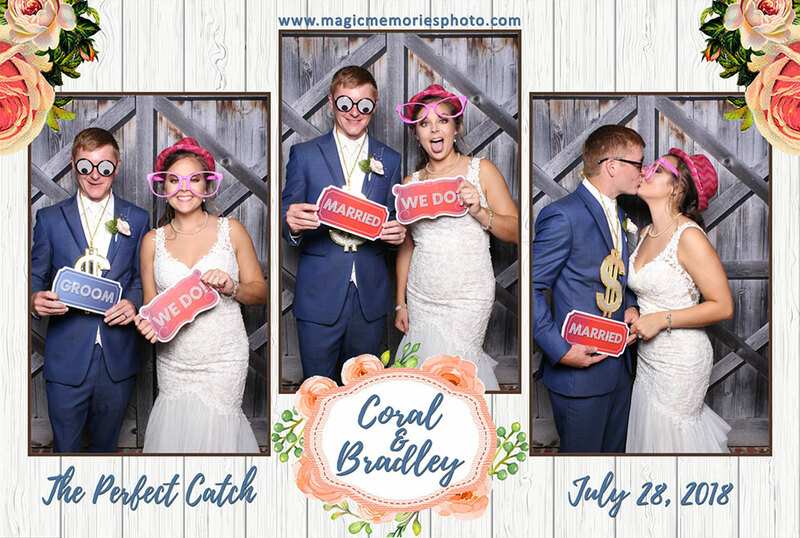 To view all of the pictures from Coral and Bradley’s photo booth, you can visit our event galleries page.